Tank blanketing, also know as "padding", is the process of injecting an inert gas into a storage container to protect the contents of the container. Because of its stable, inert, non-combustible properties, Nitrogen is the most common gas used in blanketing. Typical Nitrogen gas applications for blanketing are prevention of oxidization of cooking oils, which can change the flavor, aroma and color of the oil; to prepare products for transport; for final packaging of food products and, under pressure, to prevent contaminants from entering storage spaces. Nitrogen also has a prominent safety benefit when working with combustible products. Reduction of oxygen levels in vapor space reduces the chances of explosions and fire, since fuels require oxygen to combust. Because of its ready availability, Nitrogen is an economical choice for blanketing, especially when it is generated on site using a Nitrogen Generator from South-Tek Systems. Companies that have been purchasing from a gas supplier via a contract or bottles, can realize significant savings, increased efficiency, and greater safety by switching to a Nitrogen Gas Generator. PSA Nitrogen generators are sized appropriately to meet Nitrogen purity and PSIG flow requirements, and are designed to work reliably for 20 years or longer. South-Tek Systems uses a Flow Verification System to accurately determine flow requirements for your N2 gas application. We also use a trademarked Performance Verification System to guarantee that the Nitrogen generator purchased meets or exceeds the specification requested. To find the right sized Nitrogen Generator for your application, and for a free analysis of how much your business can save on operating costs, contact South-Tek Systems today: 888-526-6284. Circuit boards are in the "guts" of all kinds of electronics, from computers to coffee makers. Nitrogen plays a role in two different processes involved in the manufacturing of printed circuit boards. First, the board is "cooked" in a reflow oven, where it is heated up and cooled down to allow the solder on the board to liquefy and then harden. Nitrogen is used in the oven as a controlled environment and allows the boards to heat up and cool down in a constant cycle. Since both ends of the oven are open, a large amount of Nitrogen is pumped into the process. Nitrogen is also used during selective soldering, where a robot looking machine with two mechanical arms places pieces of chips on to the boards and then solders it into place. Nitrogen is used at the point that a piece is put on the board to allow the solder to set correctly. Between these two processes, a circuit board manufacturing company can find themselves facing huge costs to maintain the levels of Nitrogen needed for their product. A Nitrogen Generator is located at the plant and can generate an endless supply of Nitrogen to meet those needs at far lower expense than relying on a gas supplier. In addition, there are fewer safety concerns and worries about downtime due to shortages from delivery interruptions and liquid Nitrogen tanks that unexpectedly run dry. An on site, Nitrogen Gas Generator can bring you significant cost savings with your Nitrogen gas application, even if you use as little as two cylinders per week. Let a trained expert from South-Tek Systems work the numbers for you and start saving today! Demonstrating the portability of our Nitrogen Generators, South-Tek Systems has designed a N2 Gen Series Generator system that is mounted on specially equipped Humvees for the U.S. Military. This portable Nitrogen Generator system supports maintenance and repair of equipment in the field as part of the SEMCV program. 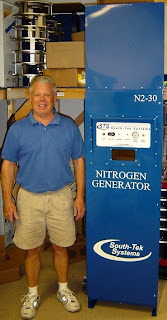 South-Tek Systems is an official GSA vendor for Nitrogen Gas Generators. The U.S. General Services Agency (GSA) provides approved products and services to federal employees and agencies worldwide. The South-Tek Systems N2 Series Nitrogen Generators are approved, accepted and available through the Federal Government GSA program. 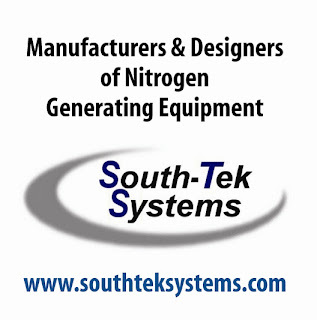 Contact South-Tek Systems for information on a custom designed Nitrogen Generation system for your business. South-Tek Systems is proud to say, "Made in the USA!" Your PSA Nitrogen Generator from South-Tek Systems is engineered using inherently simple technology, with almost no moving parts. This results in unsurpassed reliability and performance, enhancing the peace of mind of our users and increasing safety in the workplace. The generators are designed to be used in all climates, under a variety of conditions, all over the world, including in the most remote areas. The life expectancy of a PSA Nitrogen Generator reaches 20 years or more. That means that the maintenance requirements are very minimal and when necessary, parts and service can be easily obtained using local suppliers. The most important preventive maintenance is regular filter replacements. This is critical to preserving and maintaining the purity of the Nitrogen your equipment can generate. Visit us at http://www.southteksystems.com/ for more information about our Filter Replacement products and automatic maintenance program, or contact us directly at 888-5266284. Thanks from the South-Tek Team!